Water always finds an opening. Hydrostatic pressure can easily drive groundwater into the basement through gaps and cracks in the masonry. High water pressure can also cause seepage through solid concrete. “Hydrostatic Pressure” refers to a water pressure and is a major cause of basement water problems. Water weighs slightly more than 60lbs. per cubic foot. If the soil around your basement is saturated with water, there could be tens of thousands of pounds of hydrostatic pressure against your foundation. With significant pressure, it's likely that water will find its way through even the smallest crack or gap in your basement. 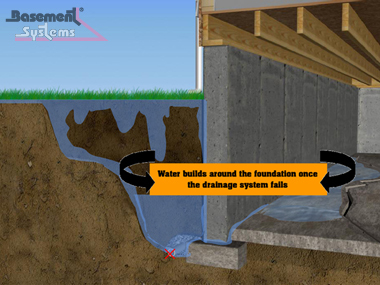 Even a well-constructed basement foundation can’t provide a perfect barrier against hydrostatic pressure. An integrated interior waterproofing system that relieves pressure is the best approach in most situations. Interior drainage systems, like our patented WaterGuard® interior French drain, collect water where the basement floor meets the basement wall. By not relying on outside drains that can clog with silt or roots, interior systems work continuously to channel water to a connected sump pump that automatically channels any water to the outside.